What we see here is that Boom Logistics is trading at a significant discount to book value. 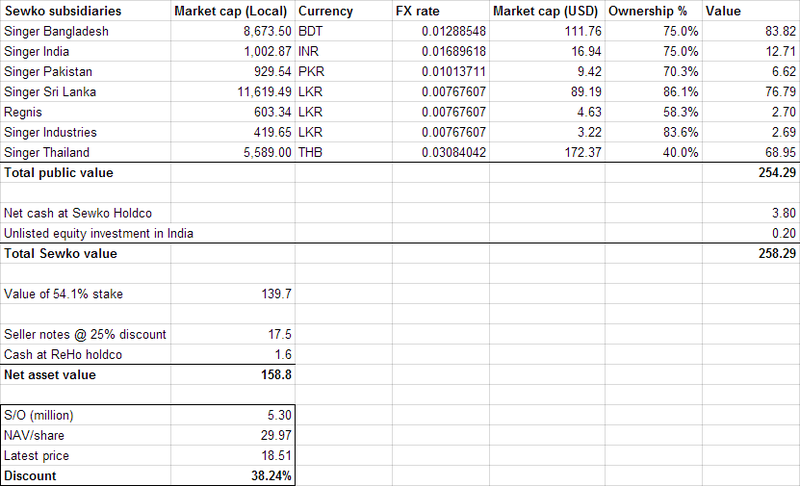 So if book value even remotely resemblances economic value the upside could be huge. At the same time there is a significant amount of debt, but it’s a lot less than what Emeco needs to cope with. The deb/equity ratio of Boom Logistics is 1.59x versus 2.88x for Emeco. The lower leverage provides a bigger margin of safety, and a lack of one was exactly why I sold Emeco. Cranes are assets that are not purely used in the mining sector making the value of the assets less dependent on the state of the Australian resource sector (and by proxy the Chinese economy). The mining sector itself is pretty important for the operational results of Boom Logistics since it accounted for 68% of revenue if FY2013. In the subsequent first half of FY2014 Boom generated A$9.9 million from the sale of equipment and recorded a net profit on disposals of A$2.5 million. If we assume that this profit is representative for the value of all the assets held for sale at the end of FY2013 the true discount to unimpaired book value is just 14.4%. 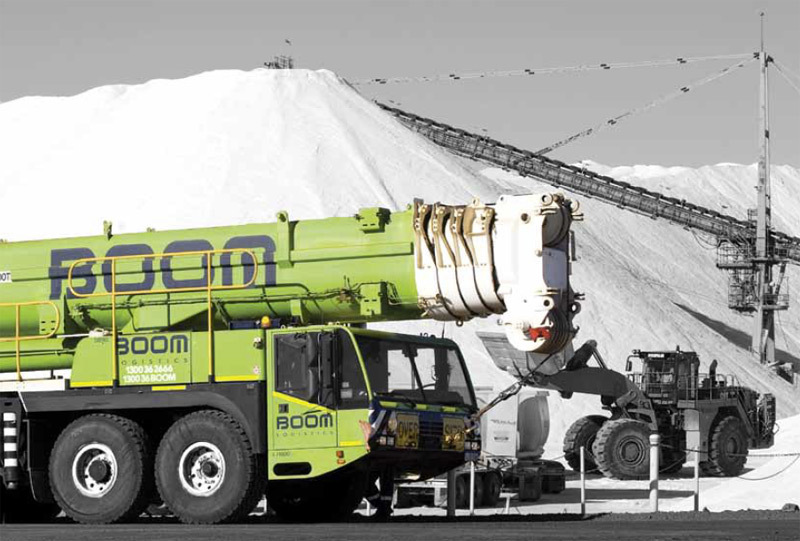 Boom Logistics sold equipment that wasn’t a good fit with the rest of their fleet and that should be expected to have less value in the used equipment market because they sold “the less recognised brands, one-off, specialised, prototype or unusual model cranes”. During January, the Group sold its Tasmanian access & general hire assets to local Management for proceeds of $1.55 million and a profit on sale was realised which will be recognised in second half accounts. In December, the Group successfully completed the refinancing of the company’s syndicated bank debt facility, which was due to mature in August 2014. The A$120 million 3 year revolving debt facility has been provided by existing syndicate members National Australia Bank and GE Capital and introduces ANZ Bank as a new syndicate member. The rigorous due diligence performed as part of this refinancing has given the Group further significant comfort in respect of the carrying value of its assets. What’s probably the best sign is that the new debt facility carries the same 7.5% interest rate as the old debt while covenants have been loosened. Note that interest rates in Australia are higher than in the US and the EU by approximately 2.5% so this is a pretty reasonable rate and a lot better than the ~10% rate that Emeco is now paying. The market seems to be thinking that Boom Logistics equipment is worth a bit less than half its book value while I’m thinking that a 35% discount is already pretty pessimistic. 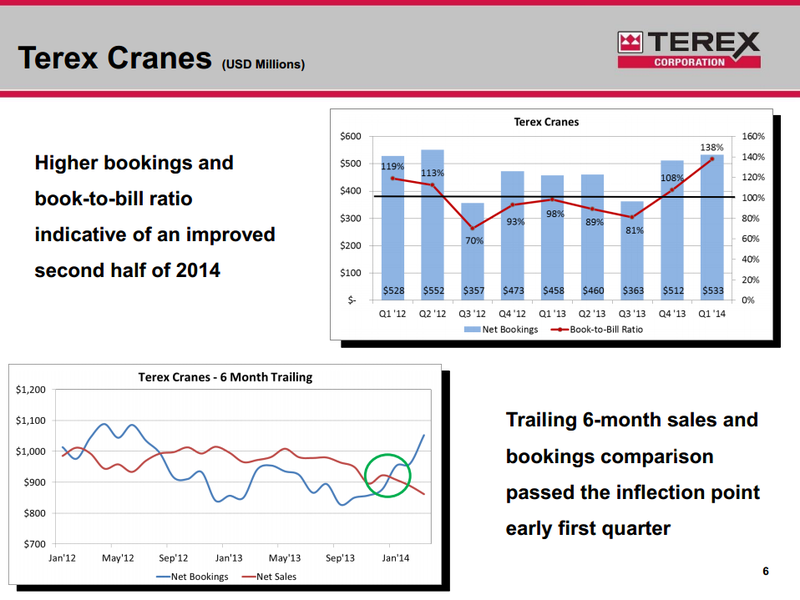 Crane segment backlog totaled $842 million as of March 31, 2014, an increase of $267 million, or 47 percent, from the fourth quarter 2013. First-quarter 2014 orders of $733 million were 29 percent higher than the first quarter of 2013, representing a book-to-bill of 1.6 times. Orders in the quarter include all confirmed orders that were placed at the ConExpo trade show, of which approximately 26 percent of the backlog will be delivered in 2015 or later. As is visible their revenue in Australia was down by a significant amount, but they are doing fine in the rest of the world. This is also a point were Boom Logistics differs positively from Emeco. 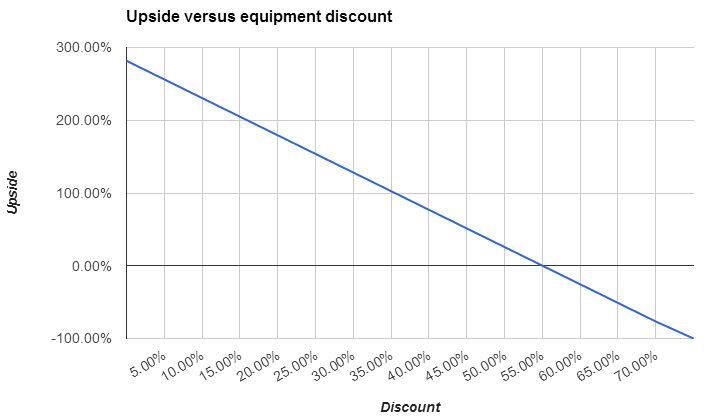 The various mining equipment manufacturers are seeing a strong worldwide drop in demand and as a result the prices of second hand equipment are also dropping world wide. Boom Logistics should have a lot less trouble to sell their equipment globally for a good price, and their results so far seem to indicate that this is indeed the case. A weak point in the thesis – one that Emeco also shared – is that insiders own very little of the company: just 1.0%. But it doesn’t appear that corporate governance is a problem at this point in time. The company put for example a freeze on senior executive salaries during FY14 which is appropriate given the current results and the fact that they are also shrinking the work force. Seeing management shrink a company is in my opinion always a good sign from the governance perspective. Following last year’s level of capital investment we expect a significantly lower requirement for new investment in FY14 and free cashflow will be directed to further debt reduction and an expected on-market share buyback. The latter is a response to the continuing gap between our share price and the underlying net asset backing per share of 51 cents. Until now I haven’t talked about earnings and cash flow, but that is because the company produced and is producing plenty of both. It’s currently trading at a P/E of just 7.5x when we annualize the results of the first half of FY2014 and exclude one-time gains and losses. If utilization improves the company could earn a massive amount compared to its current market cap, and when things don’t turn around they can sell idle equipment. I don’t hope that they need to liquidate a big part of their fleet, but I think that at current prices they could do that and as a shareholder you would still be able to generate a healthy profit. The asset value is there to provide a margin of safety. Buying something cheap that could produce great returns when things turn around is easy. Buying something cheap that can also produce great returns when things don’t turn around is a lot harder, but I do think I have found that combination in Boom Logistics. This entry was posted in Portfolio and tagged BOL.AX on June 16, 2014 by Alpha Vulture. As you can see the company is trading at a sizable discount, and the good news is that there is a catalyst on the (far) horizon for this discount to close since the company wants to liquidate, but only at a good price. Last year Retail Holdings wanted to do an IPO in Singapore, but this plan was shelved because it didn’t think it could realize fair value. In the mean time Retail Holdings pays out generous dividends and with the CEO and his wife owning 25.7% of the company I’m confident that they will try to maximize shareholder value. There is a lot more that can be said about Retail Holdings but since not a whole lot has changed the past years I recommend you check out these posts on OTC Adventures (post 1, post 2 and post 3) and this post from WertArt Capital. Note that the discount that the author of the WertArt Capital blog applies to account for the license fee that Retail Holdings pays for the use of the Singer trademark is not appropriate. The operating subsidiaries also pay royalties to the parent company to use the trademark so this is already reflected in the market value of the various operating companies. It might actually have a small positive value since Retail Holdings has also licensed the trademark to a couple unrelated companies operating in Malaysia and Australia. This entry was posted in Portfolio and tagged RHDGF on June 10, 2014 by Alpha Vulture.